(CBS/AP) EUGENE, Ore. - Jeneba Tarmoh conceded the final Olympic spot in the 100 meters rather than race against training partner Allyson Felix. Tarmoh notified USA Track and Field on Monday of her intention to withdraw. Her agent, Kimberly Holland, already made it known that Tarmoh would not participate in a runoff Monday night to settle a third-place tie at the U.S. track trials. Tarmoh, who felt all along she had won the race on June 23, did not specify in her statement why she was giving up a chance to possibly run the 100 in London. USATF President Stephanie Hightower said the organization was "disappointed" Tarmoh had a change of heart. The runoff was scheduled to be shown in prime time on NBC in conjunction with the network's coverage of the swimming trials. It would've been a boon for track. Now, it's another blow for a sport that's taken its fair share of late. The controversy in the 100 overshadowed the entire trials because USATF had no protocol in place to deal with a dead heat. And while top officials scrambled to draft a tiebreaking procedure, the athletes didn't want to talk about it until after the conclusion of the 200  nearly a week later. The tiebreak also didn't exactly address this particular situation  an athlete commits to racing and decides not to at the last minute. The matter, however, was resolved once Tarmoh stepped aside. Felix will now race in both the 100 and 200 in London. Tarmoh didn't qualify in the 200, but is eligible to run in the Olympic 400-meter relay. "The situation has been difficult for everyone involved," Felix said in a statement. "I had accepted the USATF decision and was prepared to run at 5 p.m. I wanted to earn my spot on this team and not have it conceded to me so I share in everyone's disappointment that this runoff will not happen. All I can do now is turn my focus to London." Tarmoh only reluctantly agreed to the runoff. She believed she won on the track fair and square nine days ago. "In my heart of hearts, I just feel like I earned the third spot," she said Sunday. "I almost feel like I was kind of robbed." Tarmoh leaned across the finish line and looked up to see her name on the scoreboard in the third spot behind winner Carmelita Jeter and runner-up Tianna Madison. The 22-year-old Tarmoh even took a celebratory lap around the track, waving an American flag. She received a medal and held a news conference. Then, she found out about the dead heat from reporters. The situation has been a debacle since Felix and Tarmoh crossed the line in 11.068 seconds. 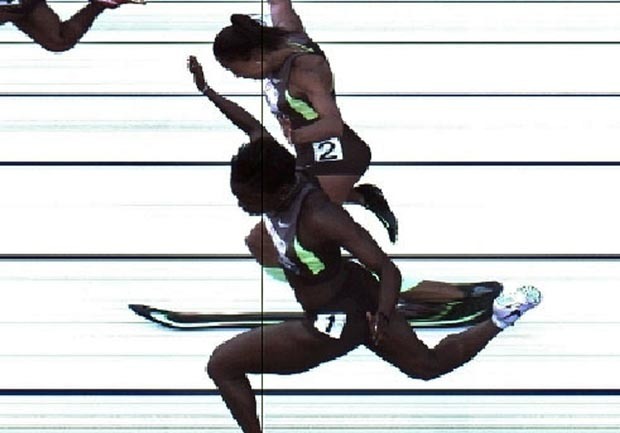 The options USATF presented to settle the tie were a runoff, coin flip or one athlete conceding the spot to the other. The athletes and their agents met with USATF representatives Sunday, and Felix and Tarmoh chose to settle matters on the track. Tarmoh, however, was clearly unhappy with the choice. "This decision was really hard for me to make," Tarmoh said. "I was pushed into a corner. They said if you don't make a decision, you give your spot up. I work too hard to just give my spot up. I had to say it was a runoff."